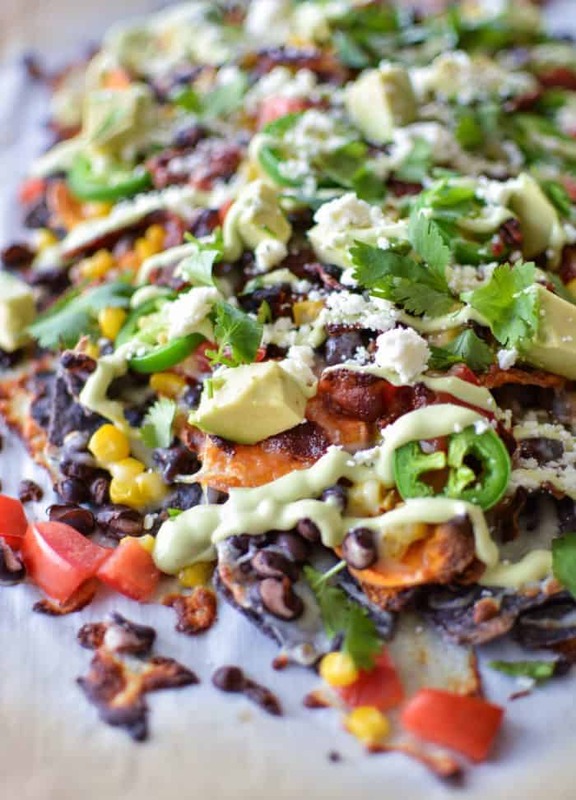 Grilled sweet potato chip nachos are a fun way to use your grill this summer! 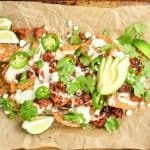 Sweet potato tortilla chips are topped with spicy chorizo, an addicting white cheddar cheese sauce, and the perfect toppings of fresh avocado and jalapeno. 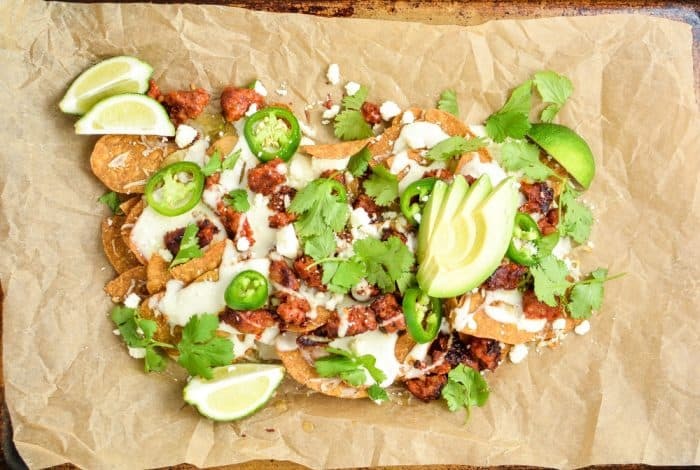 While you’re grilling up those cheeseburgers and hot dogs, don’t forget to throw these grilled sweet potato chip nachos into the mix! They are the perfect snack! We have had our fair share of pretty insane weather here in Wyoming lately. April was a mess. We received more snow than we did all winter, and most of the month was spent hibernating. It was pretty much the most depressing thing ever. May has proved to be a little bit better. It’s been fairly warm at about 65 degrees F (which is warm for here) and there hasn’t been a cloud in the sky. This means one thing and one thing only, we have been grilling like crazy! Oh don’t get me wrong, we will grill in the dead of winter, but it’s not as often and it can be pretty brutal. The grilling gets kind of crazy in the spring and summertime, and we have been taking fully advantage of it! What I love about breaking out the grill is that you can basically grill anything you want these days. There are so many fun grill toys out there that allow you to boil pasta and “roast” veggies. 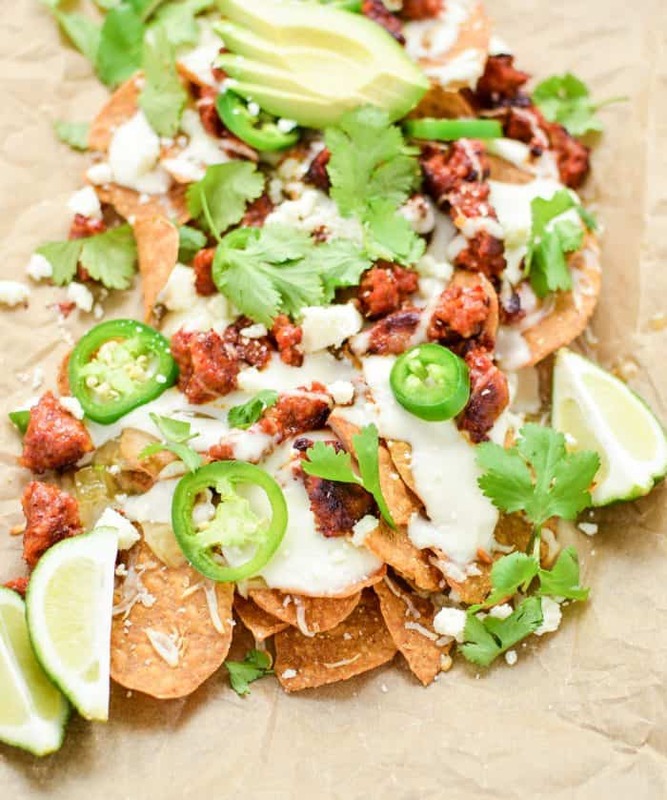 My newest obsessions are pizza and nachos…and yes, nachos can be done. They are very simple in fact! We do most of our entertaining outside in the summertime, as I’m sure most of you can relate. With that being said, I’m always trying to up my outdoor food game. I try to make sure I can make almost everything outdoors, and that includes these nachos. These nachos are very simple, very quick, and very delicious. They are topped with my favorite sausage, chorizo, and the most flavorful white cheddar cheese sauce. Fresh avocado and jalapeno give these nachos punches of freshness and texture. The cotija cheese adds another dimension of flavor. They are the perfect recipe to up your outdoor entertaining game! 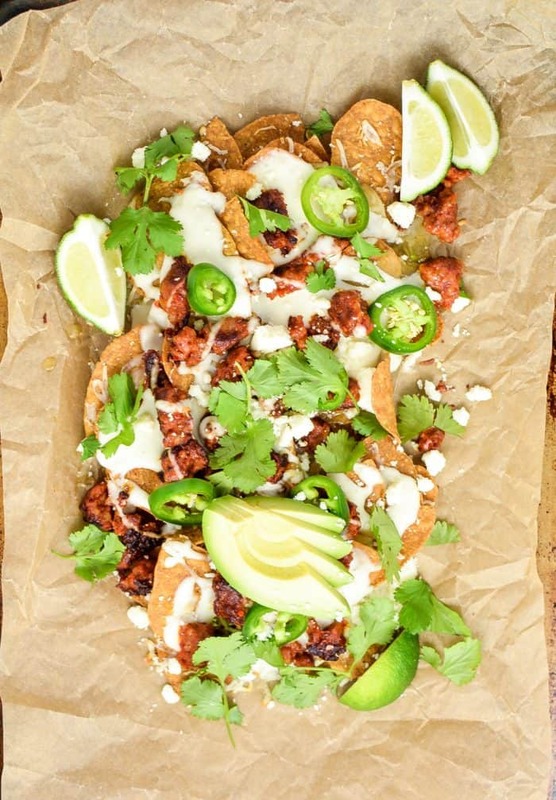 I hope you guys absolutely fall in love with these grilled sweet potato chip nachos. I know that I have! Add them to your weekend grilling plans. I promise, you won’t be disappointed! While your gill is heating up, prepare your nachos. Heat a large nonstick skillet over medium heat. Add the chorizo sausage, and cook until brown and cooked through, about 10 minutes. Remove from heat and transfer the chorizo to a plate that has been lined with a paper towel. Set aside. In a medium saucepan, melt the butter over medium heat. Whisk in the flour and cook until golden and bubbly, about 2 minutes. Whisk in the milk and continue to whisk until the sauce is just slightly thickened. Reduce the heat to low, and add the cheddar cheese in 1/2 cup increments, making sure each batch is fully melted before adding the next. Stir until smooth. Season the cheese sauce with cayenne, salt and black pepper. Keep warm over low heat. 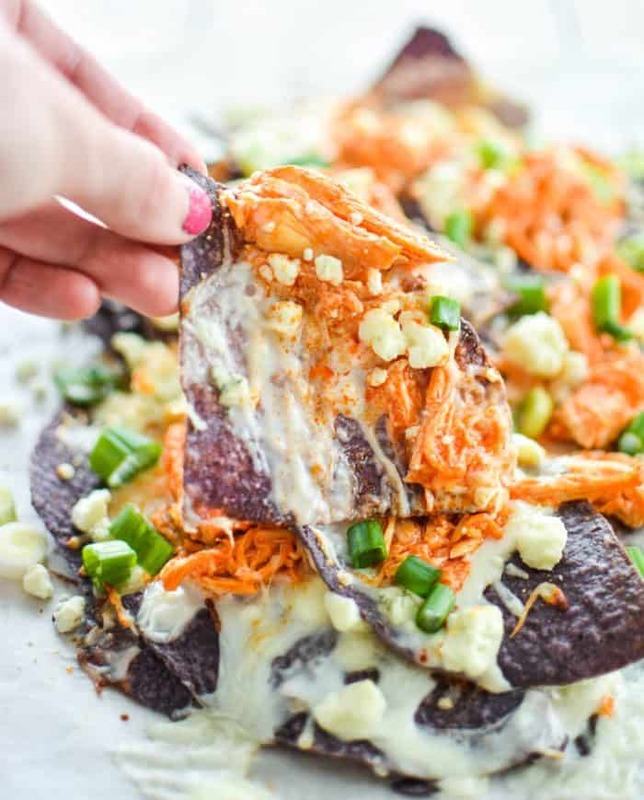 On a large piece of heavy duty foil (that is plenty long so that you can completely encase the nachos when you are done assembling), assemble your nachos by layering 3/4 cup of cheese on 1 layer of sweet potato chips, drizzling it with cheese sauce, and sprinkling it with chorizo. Repeat this layer one more time. Fold the sides of the foil up and over the nachos, making sure it doesn't touch the top of the nachos. Scrunch the foil on top so that it is easy to handle and carry. Place the nachos directly on the grill, and cook for about 6 minutes or until the cheese is melted. Remove from heat. At this point, add your remaining ingredients. Sprinkle with cotija cheese and sliced jalapenos. Top with sliced avocado and cilantro leaves. Enjoy immediately for best results! Like what you see today? Check out some other nacho recipes found over on Cooking and Beer where I’m combining bold and inspirational cooking (and baking) with the best craft beer I can get my hands on! 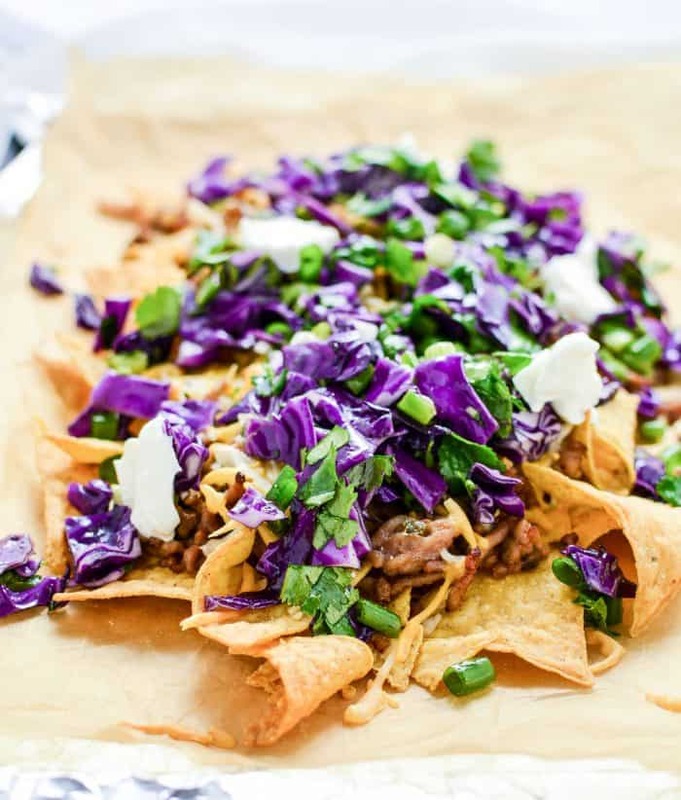 What a fun twist with the sweet potato chips on these nachos!